Our indigenous Southern African lily is a proud member of the natural flora. This plant is now sown, grown, split, transplanted, hybridized, cross-pollinated, praised, debated and shown worldwide. For the cultivation of Clivias, let us look at the where to plant, when to plant and transplant, what to fertilize and when and what to look for as far as pests and diseases are concerned. Clivias will perform well planted in the garden or in containers. The soil in both cases should be slightly acidic but more important must be well drained – Clivias do not like wet feet. Clivias will not do well in full sun, although they can tolerate some early morning sun. Plant in an area of light shade with dappled sun. The plants will do well under trees where the fallen leaves will act as natural mulch. Clivias are best planted in the spring and early summer. Transplanting and splitting are however best done after the flowering season. For those plants in a pot, watch for roots growing out of the top, poor flowering and yellowing of leaves. If these symptoms are prevalent, it is time for a larger container. 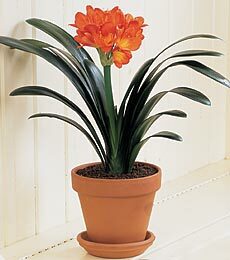 Clivia plants will need to be at least three to four years old before producing their first blooms. The Nobilis variety takes up to as much as seven or eight years. Feeding of your Clivias will change as the plants go through the different growing stages. As the plant nears its flowering season, around Early to mid September, use a fertilizer high in potassium such as an organic 3.1.5. For the rest of the season use a high nitrogen based feed for leaves and roots. Always add bone meal at planting whether in the garden or in containers. For Clivias in containers, a liquid feed such as Nitrosol or Seagro should be supplemented once every ten to fourteen days. The biggest gremlin is the lily borer, a black caterpillar with yellow bands. They will tunnel into the leaves and burrow down into the core of the Clivias. They are voracious feeders and must be caught and eliminated early. They can appear any time from September to April, but are normally most active over November, December and January. Although not as destructive, aphids, thrips, red spider and white fly will cause a fair amount of damage in large numbers. Use a systemic insecticide as a preventative spray throughout the growing cycle. Keep a watchful eye out for snails and slugs. The loose, cool and composted soil a Clivia enjoys is a haven for these pests to breed in. Apply a bait to prevent any large-scale damage. A fresh start to the new year! customers in Bedfordview, Edenvale & Senderwood. Designed & Maintained by InterComm South Africa.